Electronic Structure, Periodic Table, Bonding, Phases, Equilibrium, Stoichiometry, Thermodynamics, Kinetics, Solutions, Acids and Bases, and Electrochemistry. Math Review, Physics Basics, Mechanics, Waves, Sound, Fluids, Solids, Circuits, Electromagnetism, Optics, Atomic and Nuclear Structure. Its Contents are in 2 Test Sections (25% Each). Biochemistry is the New Focus of the Newly Redesigned MCAT. Introductory Psychology is the New Subject Since 2015. This Course Covers the Psychological, Social and Biological Foundations for Human Behavior. This is the Added Course that Separates Our Prep from Others. Comprehensive Anatomy and Physiology Provides In-Depth Coverage on Human Organ Systems - One of the Three Levels of Organization. This Course is the Vital Subject in MCAT Biology. It Offers Much More Coverage on Each System, which Takes the Bio Prep to the Next Level. These Dual Add-ons, Comprehensive A&P and Molecular Cell Biology, are Powerful Addition into Your Biology Prep. Why Rapid Learning's MCAT Courses ? Look for rapid yet comprehensive in-depth study of MCAT subjects? Solution: These are full 24-chapter college-level courses specifically designed for MCAT deep study, by our signature 24-hour Rapid Learning system, not just an outline or quick review. You will re-learn the subjects from ground-up. Tired of lengthy textbooks or over-simplified test-prep books? Solution: You will need to master the subjects in details. The best way to prepare the computer-based MCAT is to study the courses on-screen and practice on-screen. No more monologue teaching. Learn it the rich-media way with enhenced visulization and graphics for both visual and auditory learners. Why do I need to study the standalone Molecular Cell Biology and A&P courses in addition to those six required subjects? Answer: In this newly redesigned MCAT, there is an expanded coverage and strong emphasis on the biological science. A traditional general biology course might not have the depth and scope to cover all the foundation concepts in all the content categories comprehensively. There are three levels in biological systems - molecular, cell and organ system. To amplify your preparation in molecular and cellular levels, include "Molecular Cell Biology" into the mix. For organ systems, add "Comprehensive Anatomy and Physiology" course for more in-depth study. For example, for the nervous system, "General Biology" course has Chapter 13 (one chapter) to cover it. Much more powerfully, the "Comprehensive A&P" course has Chapter 11-15 (five chapters) to study the same organ system in depth. You will get a lot more bio mileages with these two added courses. Simply, go the extra miles to boost your performance. How Can I Learn a MCAT Subject in 24 Hours? 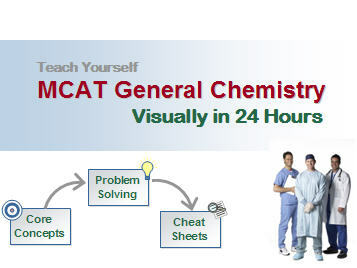 There are total of 24 lessons (topics) in each MCAT course, one lesson per hour with 30-minute on concept tutorial, 20-minute on problem drill and 10-min on cheat sheet. 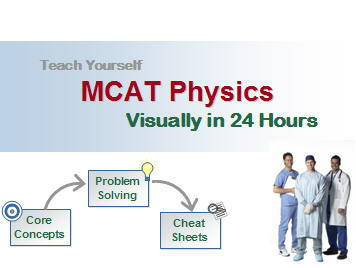 This will make up the 24 hours rapid e-learning on each MCAT subject. If you devote 4 MCAT hours each day, you can complete one MCAT course in 6 days, at the pace of one hour per chapter. What's New in these MCAT Courses 2019-20? - Revised contents for new MCAT 2015 and beyond. - Addition of biochemistry and introductory psychology. - Enhanced biology's three tiers of organizations - molecular, cellular & organs. Note: The new MCAT places heavy weighting on biological science at three levels (molecular, cell & organ). Most traditional biology is not sufficient to cover the depth and scope of every newly required big idea. Hence, to amplify your bio prep, we add two in-depth courses to best prepare you on the biology at molecular level, cellular level and system level. The Rapid Learning MCAT Series – The Easy and Rapid Way to Ace Your Next MCAT Exam! Experience the difference and take a ride in our Preview Center.